Ask fellow campers about "Spring Valley Campground" and nearby attractions. The staff were very friendly and the park was clean. It's too bad we didn't arrive earlier because there seemed to be lots to do around the park. It looks like they have a nice hiking/biking trail and a nice pool. All the utilities worked fine at our site, and we found the park to be quiet and peaceful. Good value for the money. We would definitely come again. We camped at Spring Valley Campground in a Travel Trailer. Big park. Lots of sites, plenty of residents, but plenty of room for transients up front. It adjoins a really big park with a lake, pavillions, big meadows and more --- we didn't even walk through it all. Utilities, wifi, satellite, cell coverage all worked well. Sites were gravel and level. Minuses: lots of potholes in the roads but fine if you go slow, neighbors are closer than we prefer, although spaces weren't too tight. The folks in the office were friendly, they had some RV supplies, and they were just getting the pool ready for the season. We camped at Spring Valley Campground in a Fifth Wheel. One night stay and ample room in pull through site. Only problem was rough roads getting to site. Need a little stone put in the potholes. We camped at Spring Valley Campground in a Motorhome. For us this was a stop over on the way to the Museum of the USAF. We frankly did not expect to do more here than stop and go. We did however arrive earlier than expected so we ask what was happening in the area, Small festival in town park. Spent a couple hours there, very enjoyable time. The town is nice although we did not stop, we did drive around some. Even though the CG is right off I-70 and you can see it, it is not really noisy. There are sites quite a ways back that would be very nice if you wanted a local spot for a few days to tour. We camped at Spring Valley Campground in a Motorhome. Didnt use laundry but there looked newer..site level with little work..cable tv worked fine...wifi worked good all hook ups ok..yes road in little rough and there is speed bump just go slow..staff nice..would stay again...spent last rwo nights in campsites where we had to use power gingerly...very happy here.. We camped at Spring Valley Campground in a Motorhome. Same old nasty speed bumps which they say they fixed. Be careful opening the cabinets when you park. Made reservations over 6 month in advance and they wanted to put us on the smallest site. We specifically told them 41 ft plus a toad that was not being unhooked. They did move us but we're not nice about it. We have stayed here anytime we head west but we will be looking for a new stop. We camped at Spring Valley Campground in a Motorhome. Very nice campground just off the interstate. Site for my 40' MH was more than adequate. Recreation area of the park i is spectacular, especially the lake, which must be stocked. Good fishing. Only problem was the rough road going in and the deplorable interior roads. Diagonal speed bumps are not friends to dishes in an RV. We camped at Spring Valley Campground in a Motorhome. We stopped here for an overnight on our way through Ohio. This park is right off interstate 70. So convenient! Friendly staff in the office! Firewood available. We didn't use the cable and the pool was closed for the season but looked nice. The other campers were friendly and waved as they passed by. Our site was tidy and mostly level. Bathhouse was ok. Not enough dressing room space for changing but large shower stall with great water pressure. The staff in the office also gave us great advice and directions for our next stop! All in all a great value and nice place. Oh yes, there is some noise from the highway but not a big deal. We camped at Spring Valley Campground in a Travel Trailer. We found this campsite about 5 miles off I-77 on our way to Niagara Falls and needed a place to spend the night. What a delightful, quite, spacious place to stop. It's just off the interstate, but you would never know it. The people were friendly and the sites were long and level. We didn't want to unhook if we didn't have to. Showers were clean and the store had all the essentials need, plus the normal souvenirs. We will add this stop to our list of trusted places. We camped at Spring Valley Campground in a Travel Trailer. Good cable and water pressure. Right next to Interstate 70; traffic noise wasn't too bad, but noticeable. Okay park for overnight stay. $3 for cable antenna only picked up 4 channels. We camped at Spring Valley Campground in a Fifth Wheel. 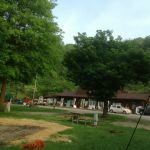 I was impressed with Spring Valley campground and how quiet it was even though I-70 was only a stones throw away. I expected a night of truck noise, but I hardly heard a sound from them. We normally don't use the campground rest rooms or showers, so I can't comment on them, but the pool looked inviting, from a distance. I was also impressed with the care taken of the permanent sites, of which there were many. All were mowed, clean and neat. I think the management is doing a great job with this campground and I wouldn't hesitate staying here again if we were in the area. My only complaint, and it is very minor, has to do with the condition of some of the interior roads. As this was our first night of a 6-week trip, our rig was extra clean until we got to the campground. The potholes along the route to our site were filled with water and mud, and needless to say there was no way to avoid them. And we all know the rules about washing our rigs in campgrounds. I could easily give Spring Valley a 10 rating when the roads are repaired. We camped at Spring Valley Campground in a Travel Trailer. The main road going in was paved, the interior roads were gravel with pot holes. The lakes and ponds were full of algea and other nasty green stuff. The water was a nasty brown and a filter is a must. There was a pool. The laundry was in good working order. All the sites were gravel and grass with fire rings and picnic tables but no patios. They were level but muddy with the rain we got. Convenient to town and the interstate. It was very quiet also. We were here 2 years ago, and there were a lot less permanent units this year. We camped at Spring Valley Campground in a Motorhome. Long pull through was perfect for an overnight stay. Good 50 amp service but couldn't get WiFi to work. We camped at Spring Valley Campground in a Motorhome. Good stopover. Right off the highway. Clean but older facilities. We camped at Spring Valley Campground in a Travel Trailer. The road leading to the park is narrow. The roads in the park need to be repaired. There are a lot of potholes and it makes the park look rundown. We had a large pull thru since we just stayed one night. It could have used a little more gravel. The park itself is nice. There is a large lake for fishing and and swimming. We camped at Spring Valley Campground in a Motorhome. Papa Johns and Pizza Hut both deliver to the campground. Cambridge is a good size town with plenty of restaurants and food stores. Are you affiliated with Spring Valley Campground ?